I am in love...my little Angel is here and I am enjoying every minute of it. Honestly, I am pretty tired as well but I expected that and every minute of exhaustion is completely worth it. I would have to stay home alone with her for the first time but that day came and I felt so at ease. It was not as bad as I had always imagined and I handled it like a champ! So three weeks in and I really haven't left the house except to take my little one to the doctor. It has been so cold that I really don't mind being inside. It was time though for me to get some fresh air. My in-laws wanted to visit and see the baby one weekend and with that, I had babysitters. My mother-in-law encouraged me to go out as well as she said it would be good for me. My husband and I stepped out for brunch and at first I was worried but we were really only a block away and I knew she was in good hands. I had such a great time with my husband. We go a chance to unwind and really catch up with each other. It is so important to have that alone time even if it just for a few hours. December has been so cold and there were flurries coming down by the time we headed home. This wool coat from Mango is very warm and I layered with a turtleneck cable knit sweater and heat-tech leggings and undershirt. 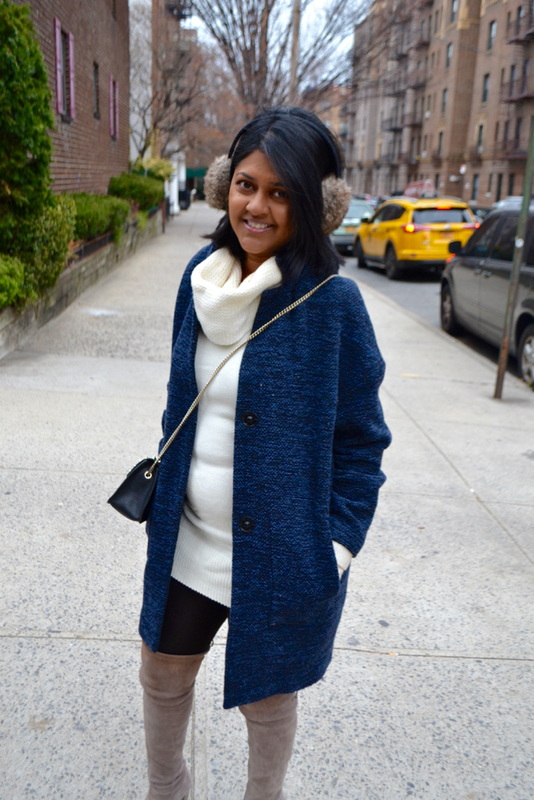 My over the knee boots provided another layer of much needed insulation. I am so happy with this coat especially the color. 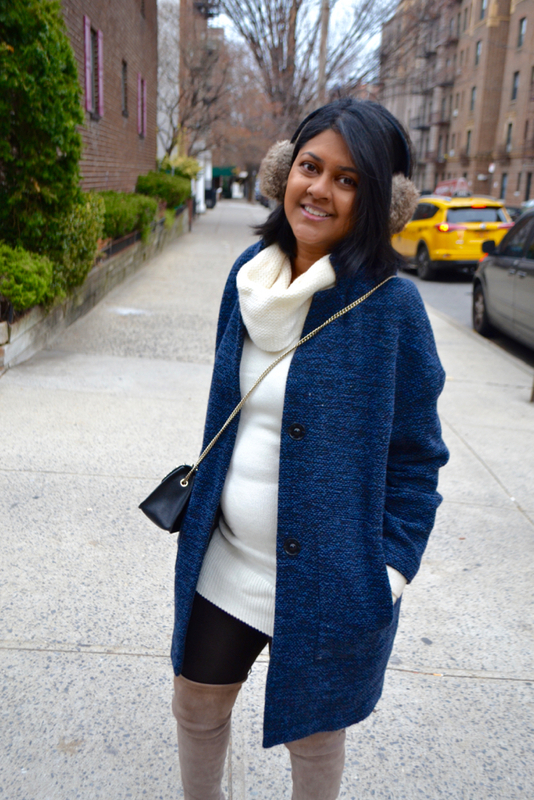 I didn't own a blue coat before and this one goes very well with almost anything. 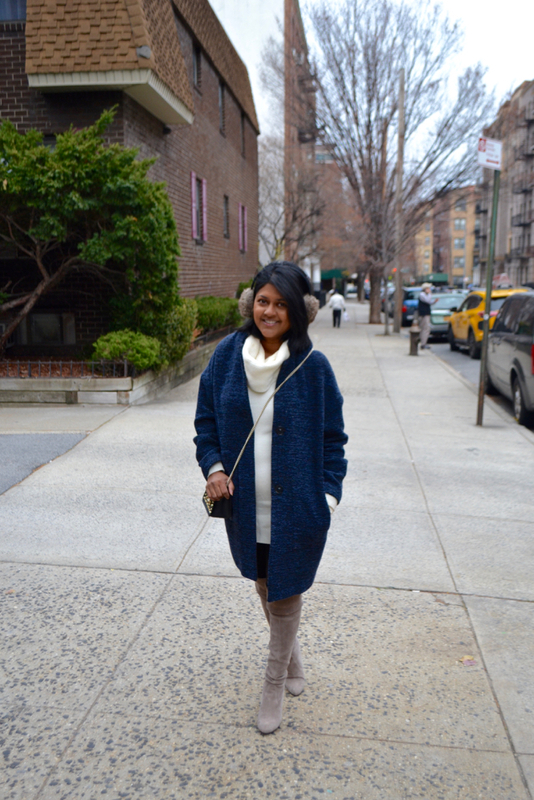 Coats are so important in New York, where is your favorite coat from?